The Oracle (pupil handbook) has been generally well-received, and one class in particular thought that “Let’s consult the oracle” was particularly amusing. Getting the Y12 to highlight/annotate in their books before making summary notes seems to be going pretty well, although – much as the same way that the real proof of the pudding is in the eating – I’m not certain that their knowledge is secure enough yet. I suppose that this is where the ‘nothing new’ lessons and the cumulative assessment will come in. The Programme of Learning splits the specification into two: side A starts with ‘what is a business?’ while side B begins with revenue, costs, profits and profitability. My Side B class have spent a lot of time doing calculations, and it’s going to be an interesting time: that class has, among others, three pupils doing A-level maths and two who scrapped a C at GCSE maths. I really need to work out how to stretch the top without scaring the bottom, and there’s a real risk of that happening – time for a chat with the Maths department, I think. Side A seems to be pottering along OK, although it felt very odd teaching mission statements to Y12, when it’s traditionally been a topic taught half-way through Y13 – I used pretty much the same activity as normal (going to the IT centre, each finding 5 mission statements, then analysing them about purpose/audience/effectiveness) but the comments in class really brought home the lack of sophistication in their understanding. 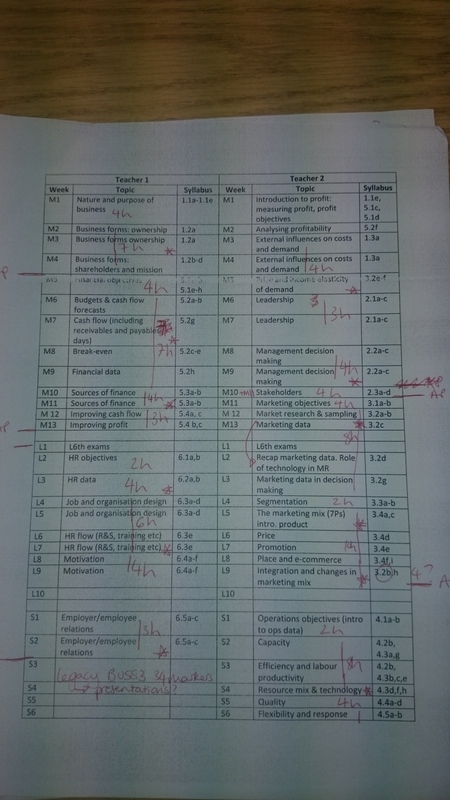 I think this will be a real challenge of the linear AQA course, in that there is none of the ‘easing in’ found in the legacy BUSS1 – topics done this week have to be covered to the same depth as topics in the final weeks of the course. I’ve given them an essay on mission statements to write (might as well start them young!) but I think it’s going to take a lot of polishing. Mind you, we’ve got to start somewhere and I’m going to think of it as a good opportunity for redrafting and formative assessment. I’m going to be stricter on the department about the completion of UCAS references: the process is that they write individually, I then compile; the final references came in 4 hours before the deadline this year. There was swearing. Not in front of anyone else, of course, although the cat looked shocked. I’m going to concentrate on get the overall set-list sheet of the tracking spreadsheets sorted first and maybe just keep all the pupil data on a single sheet, rather than splitting it into sets in advance, then having to copy and paste kids from one class to another as they change their options and their minds. I’m going to sort a system for tracking exam re-marks. I’ve just been whacking the emails into a folder, and I’m all confused. Ach well. After a very hot few days spent away on DofE expedition, I’ve enjoyed spending the morning in my (air-conditioned!) 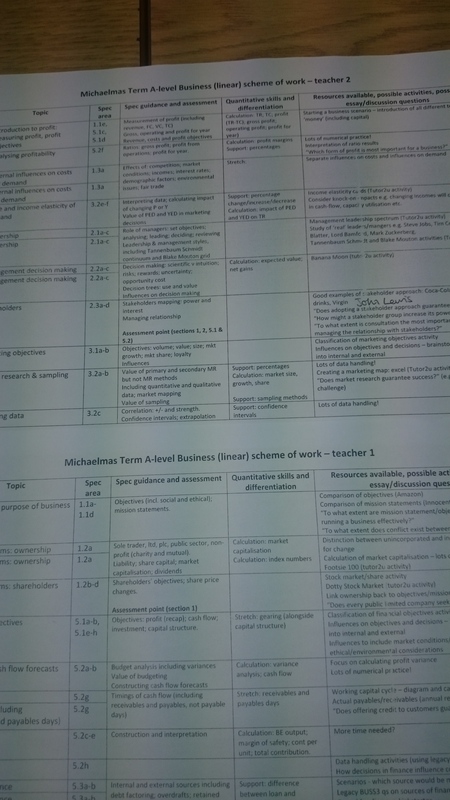 classroom finalising the L6th Scheme of Work for next term. I’ve uploaded it here, should it be of interest or value to anyone. I started with getting topics in a logical order, rather than syllabus order, so that the topics were split fairly evenly between the two teachers. I used the AQA scheme of work and a tutor2u resource as a starting point but neither really split the course in the way I wanted, particularly if using two teachers, so I had to make a bespoke option rather than an off-the-peg solution. This teaching order was to become the Programme of Learning. 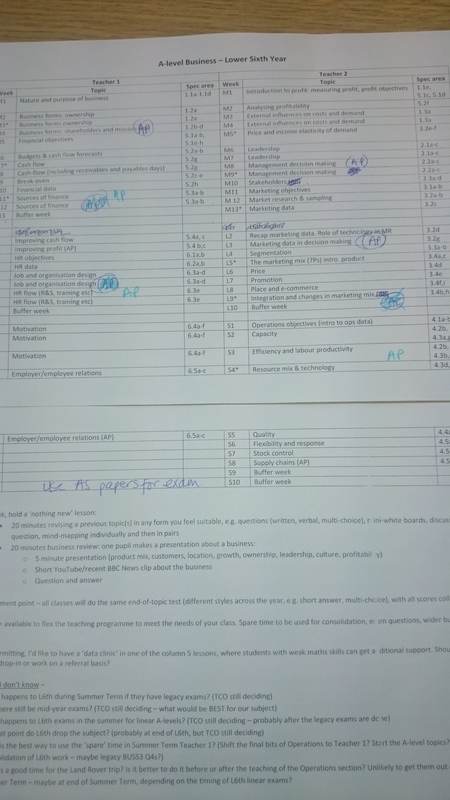 I then started putting rough timings in place – lots of maths working out how many lessons in total, and therefore how many hours, and comparing those answers to the AQA recommended timings. 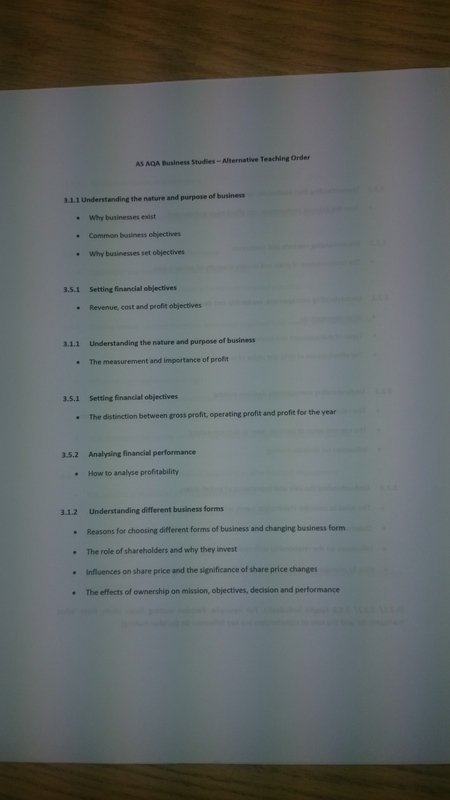 Some of this was guesswork (I’ve never taught some of the stuff so have no idea how long it will take!) but some was based on previous experience. How a new HOD who’s only been teaching a year or two can do this is beyond me! Once timings were in place, and I was pretty sure it would fit into the time available (! ), I then started to add the assessment structure. At first, I put assessment points at the end of each section, but that was then tweaked by the department last week, who felt it should fit in more closely with our schedule of internal reports. I’m not sure how I feel about this from a teaching point of view, but as the assessments are cumulative, it doesn’t really matter when they’re scheduled. From the Programme of Learning came the Schemes of Work: one for each teacher (imaginatively titled Side A and Side B). I’ve added columns for spec guidance (to help ensure we cover the right things), calculations/stretch/support (to identify areas that may need differentiation), and resources available. The plan is that this becomes a working document stored in the shared folder, and anyone can add resource suggestions as we go through the year. We’re getting a new VLE (firefly) next year which should make it even easier to share resources. No doubt more of that on another day. Having tweaked all the assessment points (and taken out the week I’d allocated for January exams: school policy is now to do these within lessons for linear subjects rather than suspending the timetable), it might almost be time to publish. Eeep. I’ve uploaded the outline programme of study for the whole of the Lower Sixth year to the TES resources area, so that anyone can download it if they’d find it useful. It’s a working document! Term 1 SoW drafted – yikes! I’ve finished the more detailed Scheme of Work for the first term. I’ve broken it down by week, although I suspect the timings will need to be adjusted every few weeks as we get into the course. I’ve started collating activities and resources for each topic, but this is going to be a work in progress: I’m hoping to keep the SoW on a shared resource drive so we can all add activities and links to appropriate websites. I suppose I ought to tackle the existing SoWs for our legacy courses now! 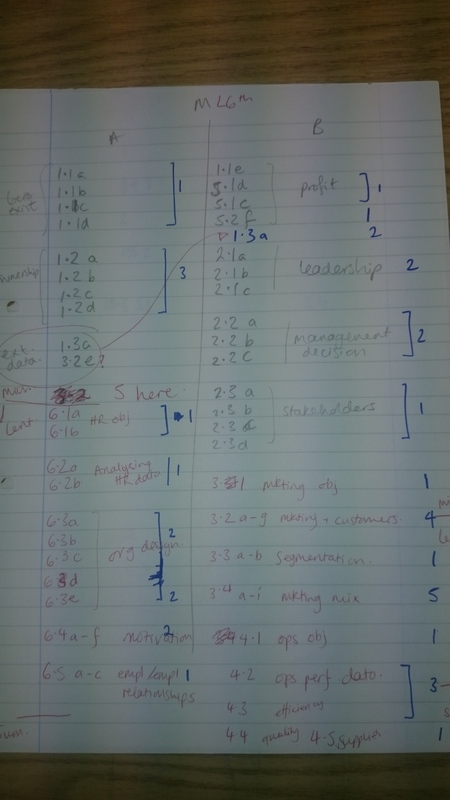 Scheme of work – first draft! Now half-term’s out the way, I’ve made a start on getting plans on paper. I had an outline of the whole Lower Sixth year – split appropriately between two teachers – with approximate timings, but nothing in detail. The outline of the year has gone to the department, and we’ve got a day off timetable in a couple of weeks to discuss it further, but I decided to jump the gun somewhat and start fleshing out the skeleton: it’ll only be minor tweaks, I hope, so nothing that a bit of copy’n’paste won’t sort out. I’ve split it down by week, so I can monitor progress through the year, although with a linear course there are inevitably fewer time pressures. I’ve tried to build in ‘buffer weeks’, so that there’s flexibility (especially important for a new course that is significantly different to our existing course, I think). For each topic, I’m trying to identify key concepts (to help others in the department get an overview), say which quantitative techniques need covering, and suggest possible activities and essay/discussion questions. For some topics, I’ve also noted areas for stretch or support. In the department, we are all experienced teachers, so I’ve tried hard not to be patronising, but also wanted to make suggestions as a starting point: three of my team have significant other responsibilities and will have limited planning time. My biggest concern is the allocating of time to each topic. I’ve used the AQA scheme of work and what we’ve done in the past as a guide, but there are some topics where I’m making little more than educated guesses. I’ve still to cross-reference what I’ve done with the inspection copies of the textbooks that we’ve received, but hopefully it should all tie up. Fingers crossed!